THE "150 CHALLENGE" IS COMING!! Can I do it? 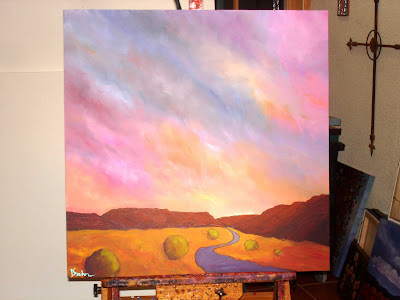 Sign up for my new blog to watch and get an email when I post a new painting. 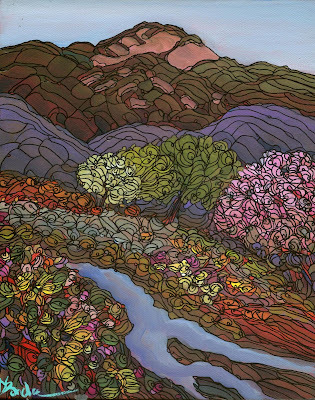 These paintings will be available at my upcoming solo show in June at Weems Old Town Gallery. Each painting will be numbered and will be previewed on the evening of the first Friday in June, 2009. There will also be 3 larger pieces for sale at the special price of $150. 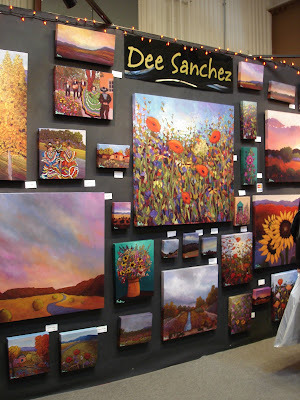 Paintings will be available for purchase when the doors to the gallery open at 10:00am on Saturday morning. More details to follow. The first painting of YEAR 3 of being a daily painter - it's exciting to me to begin again. So many subjects, so little time! 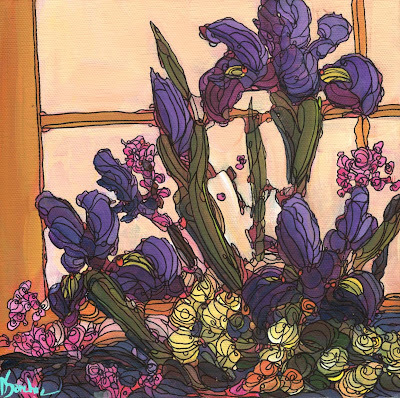 I love iris and when I was growing up, we lived right next door to my grandmother. She had them all; dutch iris, bearded, in every color you could imagine. I used to play in the iris beds and the smell was heavenly - one of the most beautiful smells you can imagine. My grandmother was always digging up irises to give to anyone who came to visit. When I was looking for a photo to post today, I came across this photo of the interior of a really nice hotel in Santa Fe. It seems fitting for today. Another year! 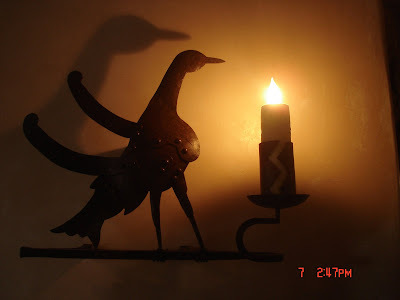 A light of hope! New plans! New dreams! New ideas! New goals! A new chance to start over! Well, let's start with new plans - I have set a big challenge for myself for my new show in June! The show details are below. 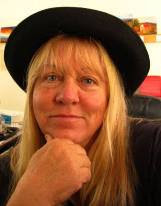 My dreams for 2009 are to get in shape (this has many sub-goals), travel and spend more with my husband, have a big organic garden, begin a yoga practice, meditate every day, do more plein air painting trips, make some art videos, and help my two daughters to realize their dreams. I also want to meet more people who enjoy my art and just have more fun. Be spontaneous! I think the older we get, the more we forget how to just relax and enjoy being alive. I think all of my goals are realistic and very achievable. 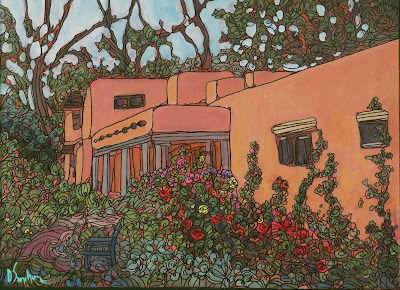 Workwise: I have four commissions to paint and finish in the next two weeks - Dancers, Cosmos Field, Morning Glories, and the Taos Church. 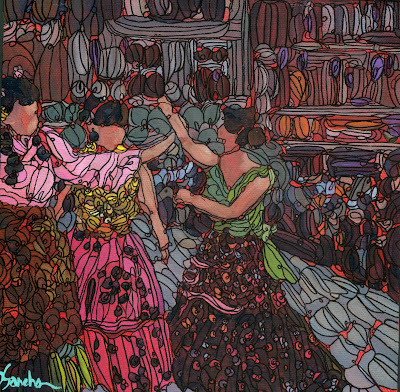 My new challenge starts next week for my show in June at Weems Gallery Old Town. 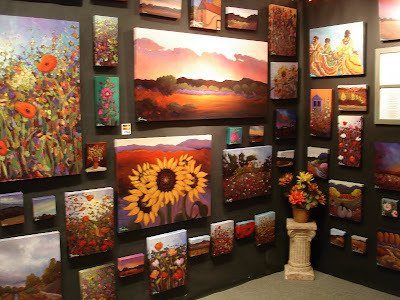 The paintings will range in size from 5x5 to 12x12. 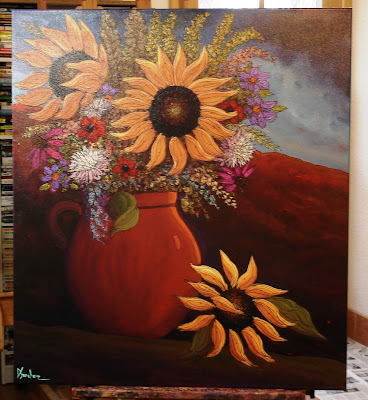 I will also paint a few larger sizes: 12x16, 16x20, and have one or two large paintings as well. All for $150 or less! A great time for you to beome a new collector, build up your current collection, or just come to the show to see if I met my challenge! So, as you can see, there is A LOT of painting in my future. Thank you all for tuning in, keeping me sane, giving me good feedback, purchasing my work, and just being there. It's a great big beautiful world we live in, filled with good people, and I love you all. This has been a hectic, but wonderful year - I've made lots of new friends and defnitely kept the old. I love you all. This is my Christmas tree. 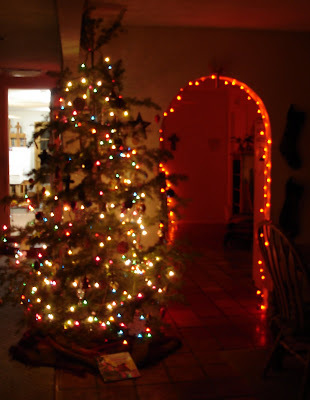 The orange twinkle lights go into my kitchen. On the left, you can see the door to my studio and one of my easels. Today, I am finishing up my shopping, cooking, wrapping, and the million other little things we do to get ready for the holidays so we can enjoy our family and friends and just spending time together. May you have a wonderful Christmas and many blessings next year. 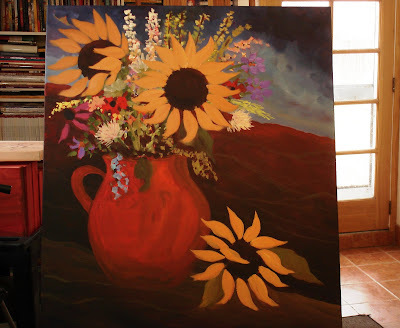 Please scroll down to see the finished sunflower commission. I think it's pretty beautiful! I just had to throw this in! The completed commission - I love it! 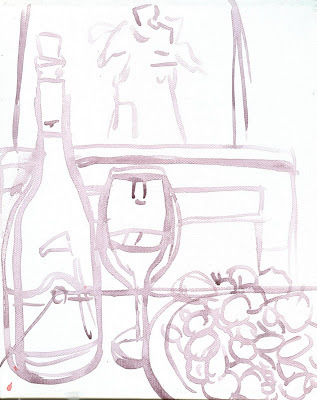 When I start sketching, I use a loose application of burnt umber and a paper plate. Tomorrow, I hope to video the underpainting for you. My two small commissions are complete. Now comes the two big ones! 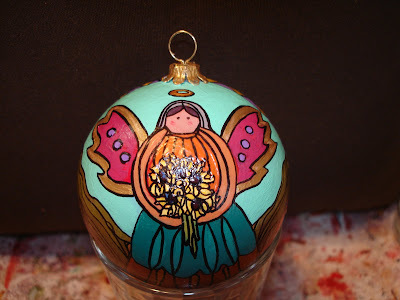 This is an ornament I painted for an old friend - we went to middle school together. I always envied her because she had seen the Beatles in concert and she had a cool Southern accent! You can't see in the photo but there are little red poppies all across the bottom and a line of lavender and yellow triangles all around the middle. 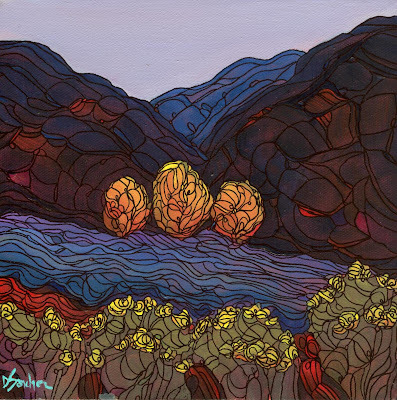 I have had this painting a long time and was going to keep it, but it is taking up valuable space in my studio. It is 20"x20" and framed with a beautiful custom honey-colored pine floating frame. This painting would normally retail for about $650. I am offering it through Paypal starting later on today through Sunday for only $250 plus shipping. Shipping should be around $50. 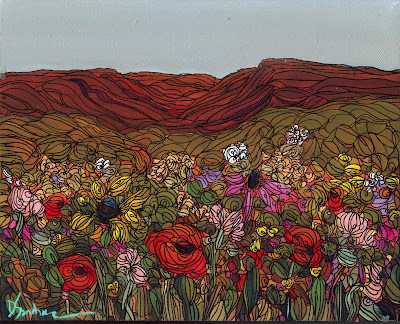 A wildflower meadow beneath the mountains. This painting to me, has a stained glass feel. Purchase information is below. To all ornaments purchasers: they should all be finished by today and shipped out by Friday. Thanks for being patient! 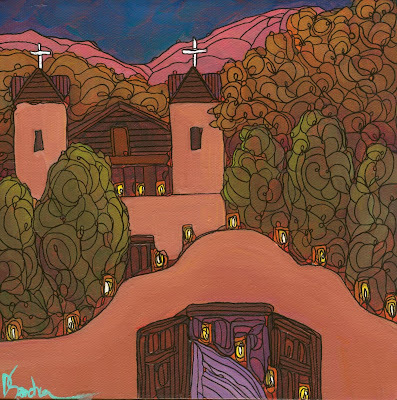 Another in my series of seasonal New Mexico churches. Tomorrow I am working on completing ornaments to ship out this week. 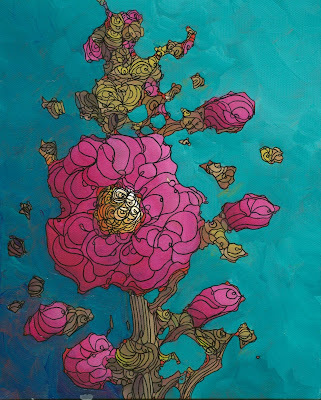 A rendition of a hollyhock painting I did for my Weems show. 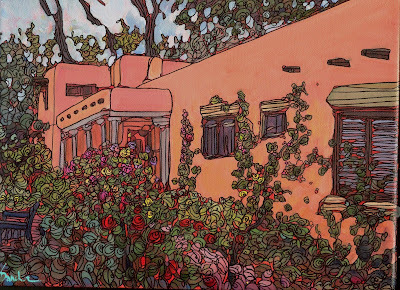 This painting is from a photo I took in Taos this year. Of course, I embellished a little. The original was in bright daylight next to the highway. I added a mysterious moon and the farolitos. The highway became a nicelittle sidewalk. As you can see, Bella has moved herself right in and captured half of Roy's territory. Notice how his feet are hanging off the edge of the bench. He's way too sweet to her. 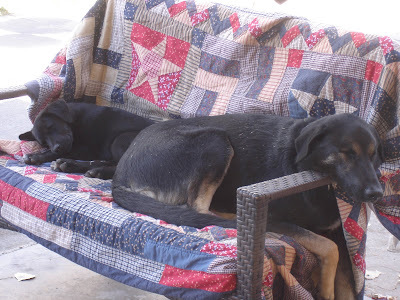 If he's laying on the bench, she will bark at him until he gets down and then she will hop up and try to take up the whole space. They are better than television! Today, all of the antique stores, schools, etc., in my neighborhood are having Shop and Stroll and Holiday Bazaars so my cousin and I are going to check them out. Just to get in the spirit of the season and have fun. Probably no painting today! 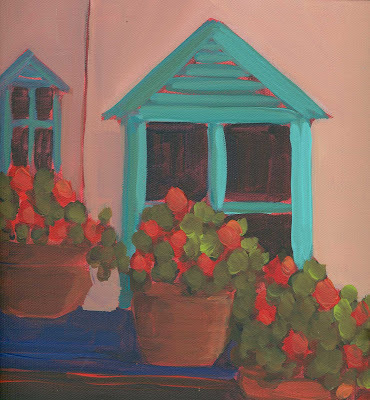 A nice little hollyhock painting with a turquoise window. Available for purchase, see below.
" 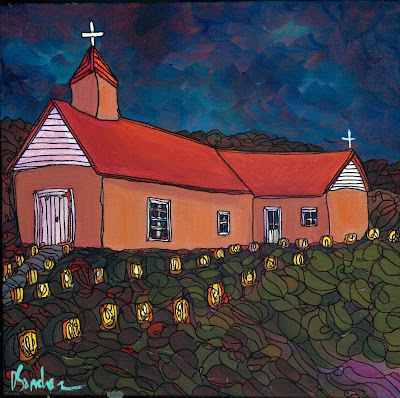 HIDDEN CHURCH AT GOLDEN"
A luminaria painting of my little church at Golden, NM, before they replastered it into two different colors. I like the new but I loved the old. I'm still working on commissions and ornaments, so today will be a busy day. I will try to sneak in a daily painting too. I saw this video on my good friend Pedro's blog and it made me smile and think about just how far away I've gotten from being spontaneous and doing something JUST FOR FUN. Enjoy! 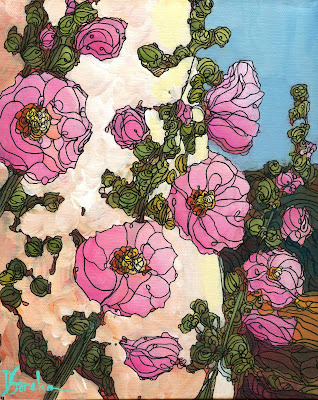 This is a smaller version of a hollyhock commission I'm working on. I am offering it for sale at a special price of $45 plus $10 shipping. 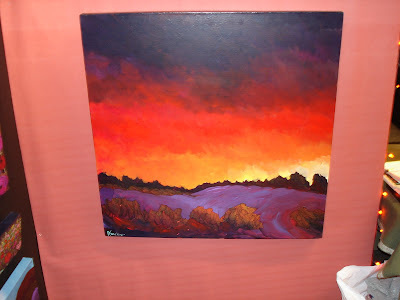 I have about three more 6X8 canvases that I am painting this week and will offer them to you at the same price. I think they'll make nice Christmas gifts for someone, or a nice gift for yourself! Purchase information is below. 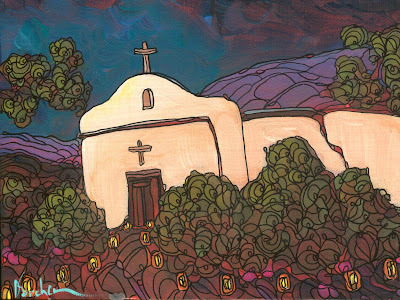 I'm painting so many churches and all things "New Mexico" and I decided to sketch something a little different to challenge myself. I've had this photo sitting around for a couple of years and always thought, "I'll get around to this someday..." Now I may look at the sketch for a couple of years, I don't know! This is a table with fine wine, grapes and a fireplace in the background. I believe that's an angel sitting on the mantle, not sure from my picture though - it's a little blurred. 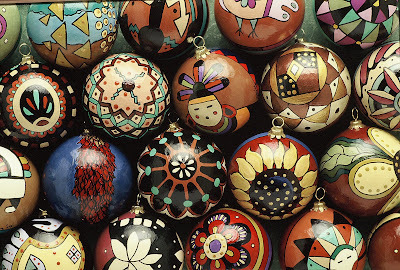 So today I will be working on 15 ornaments, two medium size works, and about 8 small commissions. 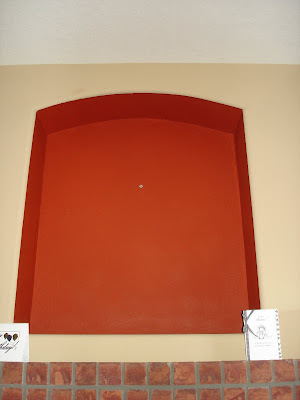 I also got my large canvas back yesterday that will be going in a big nicho over someone's fireplace. And next week is my birthday! I will be turning 54. So many things to do, so little time....enjoy your day! 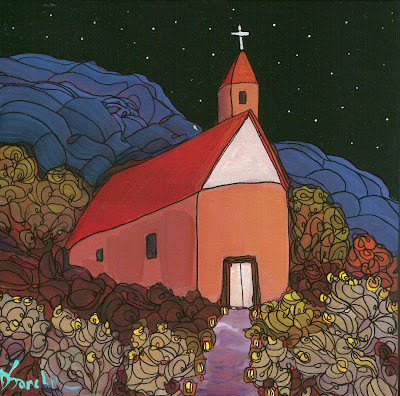 "CHURCH AT LOS RANCHOS DE TAOS"
Aah, so simple, yet so spiritual. This is the most beautiful church in New Mexico, in my book. Chimayo is very special too, but I believe that the back of this sacred adobe has the designation of being the most photographed church in the world. I may have just heard that somewhere! I have some video of it that I may try to get on later. Purchase information is below. 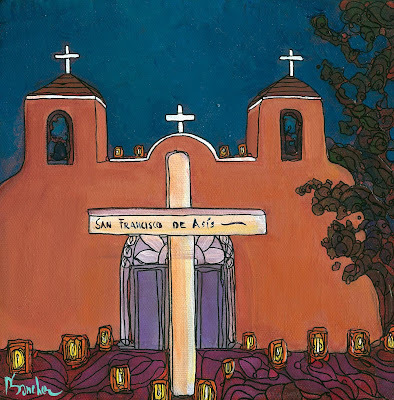 Another in my series of New Mexico churches and luminarias. This is maybe my favorite so far. I love the sky and the faint shadows on the adobe walls of the church. I want to be here on Christmas Eve. I am working on a couple of special order ornaments this week. If you would like an ornament created for your tree, please email me this week with your request. If your order is accepted, they will be $30 plus shipping and I will be working on them for this week only, so I will accept orders on a first come-first served basis. I can paint pretty much anything on an ornament. 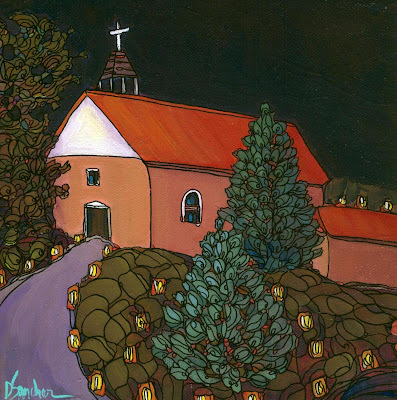 One of the favorites this year seems to be a church with luminarias. Payment is by Paypal only. 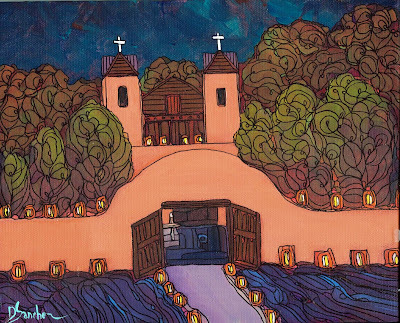 I never tire of painting these little village churches, especially Chimayo. I've never seen it with luminarias, maybe I'll be lucky enough to drive up there on Christmas Eve sometime. Purchase information is below. I felt like doing something a little out of the ordinary. I dug up an old photo of some dancers performing on a cobblestone street in front of a small crowd. The colors are a little unusual for me; more muted and understated. Anyway, I hope you like it. Purchase information is below. 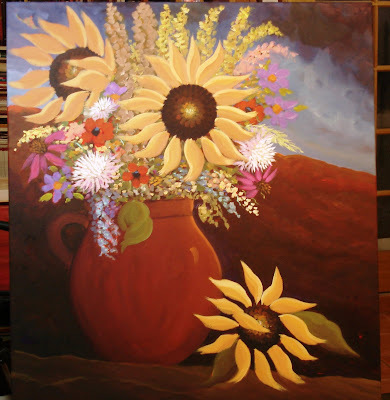 Email me with a subject or photo you would like to see me paint. I will choose the first email I receive after 8am Mountain Time. Please don't make it too hard! I'm back with the dancers tonight. 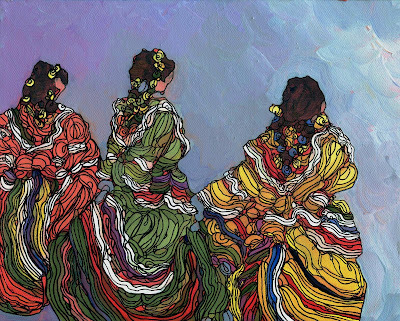 I love these colorful dresses, they are much more spectacular in person. Especially when there's a big group of performers and they're all twirling around. Very beautiful to see. And the music...aah, that's a whole 'nother story! 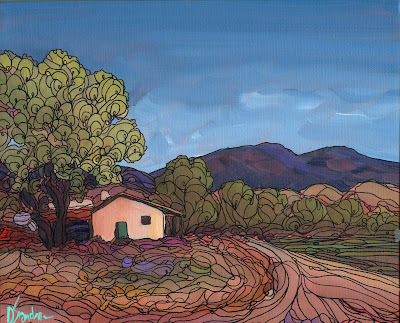 This is the first of several seasonal paintings. 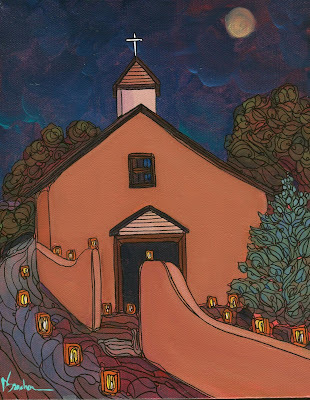 A quaint little New Mexican church with Christmas trees and luminarias. Or farolitos, depending on where you live. I may also attempt a couple of snow scenes, something I've never painted before. 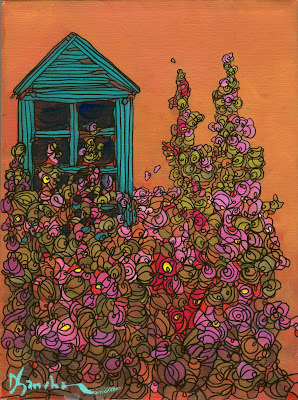 This painting is a rendition of an older piece I did on this blog a while back. It's a commissioned painting and I think it came out better than the original. It's a little brisk here this morning. My new puppy (and her older brother) have been waking me up at about 7am to go outside (they sleep in my studio), so I have to prepare myself for the blast of cold. Then it warms up nicely during the day. As soon as the sun goes down, wow, it hits you again. 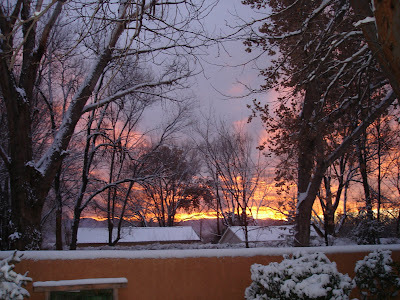 That's New Mexico for you! 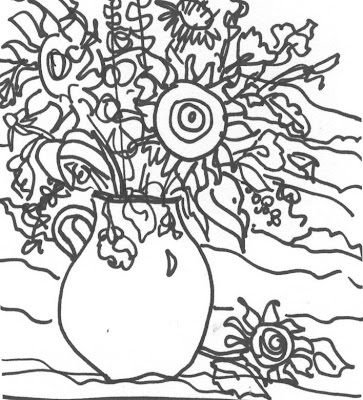 Watch for a church tonight and maybe sunflowers tomorrow....and...have a wonderful day today. 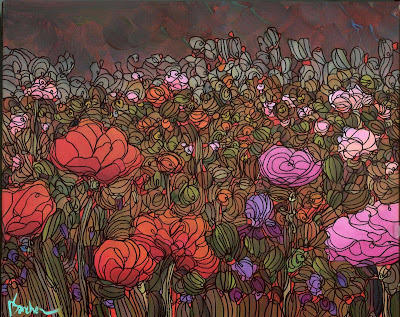 My favorite paintings - wild masses of flowers with bits of color spread throughout. I have decided to leave each of my daily paintings up for approximately one week. If not sold, they will be placed in the galleries and may be purchased there. 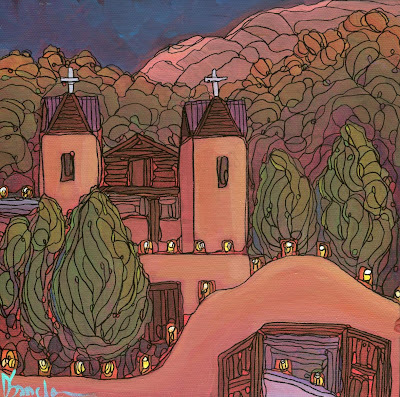 Tomorrow I am thinking of a New Mexico Christmas church with luminarias. This is my first daily painting after the show. I was looking through photos and the subject matter just jumped out at me. 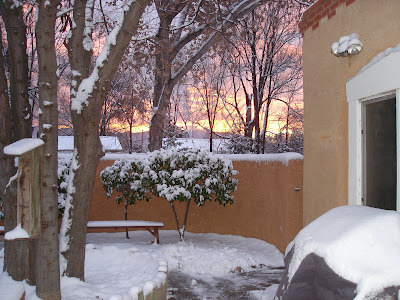 Taos is so spiritual and beautiful it can take your breath away, and I would love to be there right now before the heavy snowfalls come. I love the acequias and the old-fashioned tradition of irrigation ditches - we have one of our own that we open every spring and it waters the whole yard. I really love this painting. 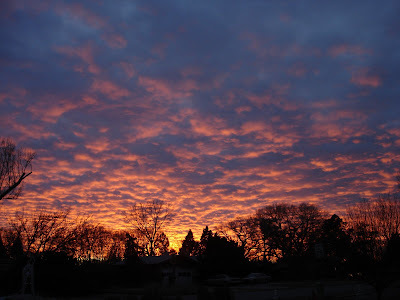 It's a beautiful sunset with a purple foreground. It's available for purchase at Weems Old Town, information is below. Today I am actually starting a few commissions I received from the show and a couple more that I want to finish this month. One is large, three are small, and two will probably be in the medium-size range. I'm also toning my daily painting canvases, going to work out, and doing some yardwork. And I thought life after the show would be easy! 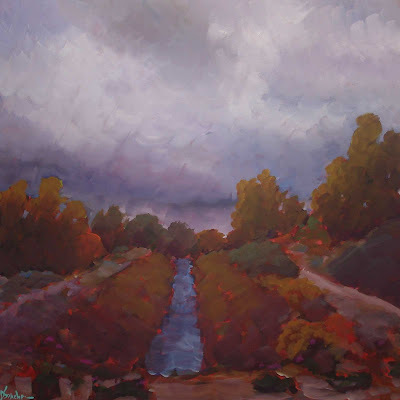 Enjoy your day and look for the next daily painting posting coming soon! 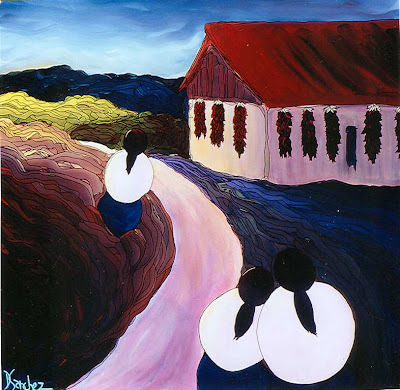 Paintings: Weems Old Town 303 Romero St. NW, 505-764-0302, Albuquerque, NM. I finally got my computer back today. I had to get a whole new system and boy, was I missing my blogsite. I am finally home from the show, it was awesome. Bunches of hard work, but very worth it! 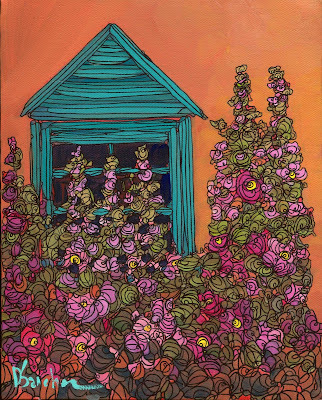 I sold a lot of paintings and saw old friends and made some new ones. Well, it's almost here - I have today and tomorrow to finish up a million things and get ready to display my work at Weems Artfest this weekend. I'm excited! Even with being sick, I am extremely proud of the work I've done and what I've accomplished for this show. 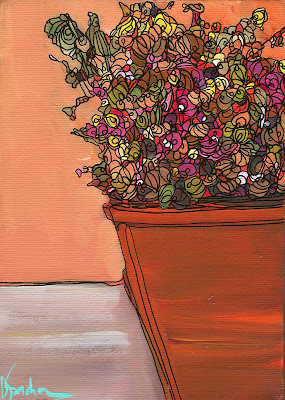 This painting is one of the smaller pieces I finshed yesterday. 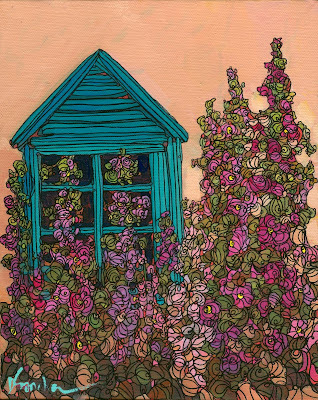 Today I'm varnishing several large paintings and maybe doing one of two 5x5s. They make such nice Christmas gifts. Anyway, I will post a couple more tonight and here is the show information. Come visit me! I'm back! I'm working on the last of my paintings and will be working up through Wednesday night for my show at Weems Artfest next weekend. I love this painting. It's a work in progress here, although it's actually finished now. I am in the process of creating an inventory of all the paintings and I hope to post more when I'm through. Thanks for the emails and cards when I was sick. I'm feeling a thousand times better and am getting excited. Almost all postcards went out today, except for a few stragglers. Have a great weekend! Good morning! I'm feeling a little better today, I seem to have come out of the "pneumonia fog" a little bit. Lots of works in progress going on right now. I will finish this one up and write more later. Enjoy your day!